You turn the page. A picture is off to the side as you stare at rows of pinyin. But that’s not all… there is something below the pinyin. You squint your eyes and there it is: a row of Chinese characters. At first glance, you know a lot of these. In fact, at the beginning, you don’t see a single character you don’t know. But you’re not so certain because you’re distracted; it’s that pinyin! It’s got a tractor beam lock on your eyeballs and just like the Millennium Falcon, you can’t get away. Sweat starts to bead on your forehead as you exert every ounce of will to try and focus on the characters, but you are already within the gravitational pull of the pinyin as it crushes every ounce of desire to read characters. When Chinese children begin learning characters in school, they already speak Chinese. In the 1st grade, Chinese characters are introduced to students as characters that represent words they already know and can speak. At the same time, “radicals” or 部首, are introduced and meanings of the individual components of a character are explained. New characters are introduced daily, along with short reading texts or 课文. At this early stage, characters are learned via rote memorization and pinyin is not even introduced to the children. Some children are still learning their ABC’s (for pinyin as well as for English). Daily homework includes practice writing of characters taught that day, often with additional characters assigned by the teacher. Termed as 默写 or “writing from memory,” rows of practice characters will be written into small notebooks used specially for writing characters. The next day in class, students are usually quizzed on the characters practiced the night before in 听写, where the teacher reads the characters and the students write each one in a booklet. The first semester of 1st grade focuses on learning these building blocks of Chinese characters. They will finish the first semester with having been taught about 250 characters. Towards the end of the first semester, students begin to learn pinyin. By the second semester of the first year, the kids learn more pinyin, and when one of the reading texts for a chapter uses a character that has not been taught, pinyin is put over that character to help the reader. At the beginning, maybe 2-3 characters in the entire text will have pinyin over them. Students already know how to say these words in Chinese and now they are learning the characters. 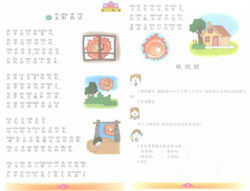 By the end of the first year, the children have been taught over 600 characters and have a solid foundation in pinyin. They learned to read characters first and pinyin second. When 2nd grade begins, all of the reading texts have pinyin above the characters. This is a great help because at this point characters are introduced more rapidly and it is easy to forget a character that was taught some time ago. It is provided as a reference to the readers in case they don’t remember how to pronounce the characters. 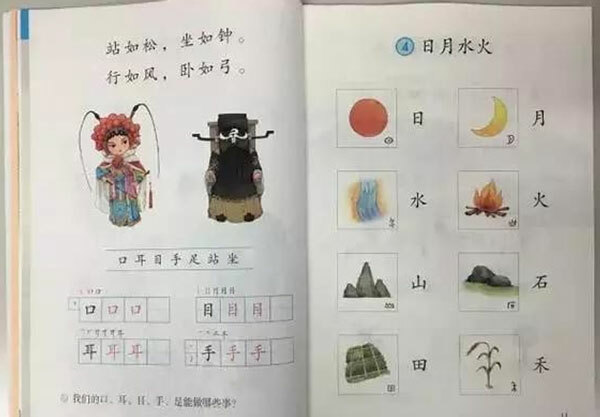 Please enjoy 《太阳的话》 from a 2nd grade text book. Click for a larger image. Following this process, pinyin over the characters works very well because the students have learned how to read and build a solid foundation in characters before they even began to understand pinyin or English. 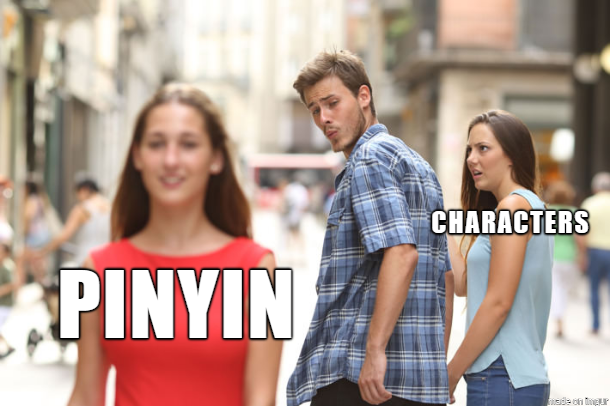 Characters are much more natural to read than pinyin, and they don’t carry the same rich meaning that characters do, and therefore it’s easy to ignore pinyin when it’s over a sentence. This learning process works very well for native Chinese speakers and it is highly effective. I have experienced this firsthand, as two of my children attended a local Chinese elementary school in Shanghai. For those of us for whom our native tongue uses the alphabet, by the time we are in 1st grade, we’ve mastered our ABC’s, been introduced to phonics, and have begun to read simple words and sentences. Words that use the alphabet are simple and natural to us. I sometimes joke that Chinese characters look like spooky animals to a new learner, but it’s not too far from the truth. If you don’t know the character, you just don’t know it. You cannot phonetically sound it out, but you can do that with English words if you know the phonics. 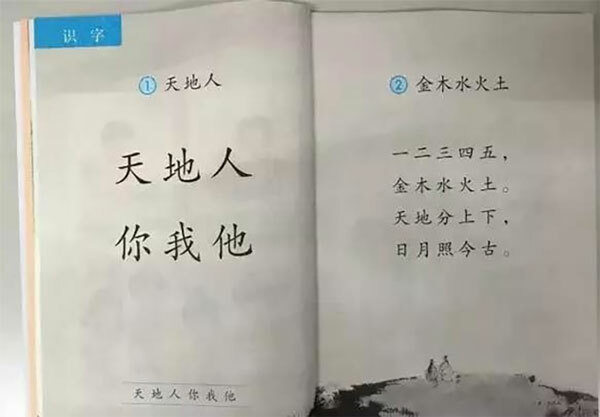 This is the learner’s conflict commonly found in Chinese textbooks and reading materials: pinyin written above the characters. The alphabet-loving-eyes are naturally pulled away from the characters towards the pinyin. After all, it’s an order of magnitude easier to read than characters, even if we know the characters! Even if the reader covers up the pinyin, he inevitably uncovers it to “check” or confirm what he read is correct. So what’s the big deal? The problem is that this creates an over-reliance on pinyin and actually slows down the learner’s path to building speed of character recognition, reading speed, and fluency. This is how it works. 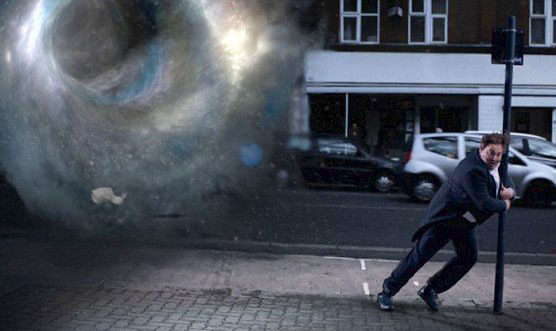 The more encounters the reader has with a character, the more she will build the speed of recognition of that character. Pinyin over the characters distracts the reader from the characters. Pinyin over the characters creates over-reliance on the pinyin. Because the reader spends time reading both the pinyin and the characters, the overall reading pace slows down. It is also for these same reasons that I am not a big fan of the “click your way to fluency” concept which many apps and software enable by clicking or hovering over a character for an instant pinyin and translation. They have their place and use for sure, but utilizing these aids to “read” a text does little for your progress towards fluency (mainly because you are understanding the text in English as opposed to understanding it in Chinese). Some may be saying, “but without the pinyin, I can’t read this Chinese text at all!” If you need pinyin over the text to read it, then you’re not reading at the right level, and you’re not learning the words you’re reading. Put it away and find something easier (if you can) and I’ll kindly redirect you back to a previous blog article about reading at the right level. For all of you publishers and teachers out there, please do not put pinyin over text that is intended for CSL (Chinese Second Language) students. If you have to use it, only put it over the characters that the reader is not intended to know. And for pete’s sake, don’t tell us just not to look at it. It’s about as effective as this button. 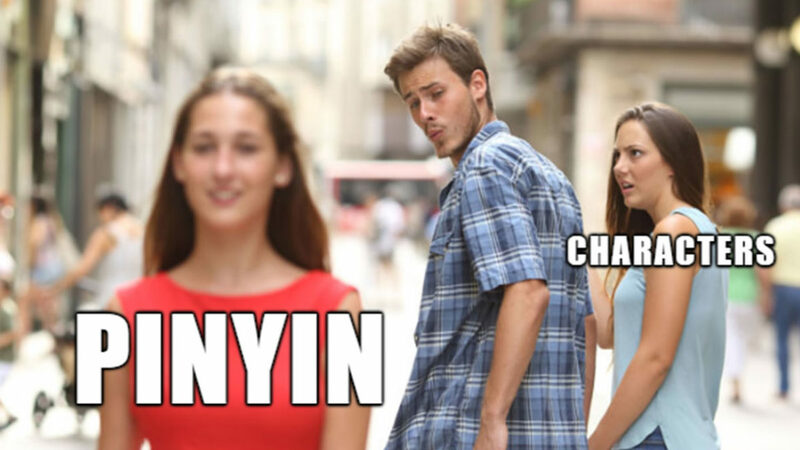 Pinyin is a crutch and sometimes we need a crutch to lean on. Without it our learning-lives would be much more difficult. My hope is that we not create an over-reliance on pinyin and help learners walk on their quest to fluency. Great article, Jared! I heartily agree that pinyin should never be put over characters, which is why Iike the Integrated Chinese textbook series much better than Practical Chinese Reader. But here’s the rub: as you implied (“if you can”) finding simpler readings than Mandarin Companion or Chinese Breeze is basically impossible. About all that’s available are the dialogues in course books, which are not the greatest reading experience. We really do need some elementary but still interesting readings. I am still at the very young children’s level of reading in characters. When I get a book with pinyin over the characters, I cover the pinyin with opaque colored tape or sticky notes. If I don’t cover the pinyin, my eyes go to that first, and then I’m never sure if I really know the character or not.